Gopinath Bordoloi a leading Indian independence activist and the first Chief Minister of Assam was born on 6 June 1890 at Raha. His father Budheswar Bordoloi was in the Government medical service in a junior cadre. His mother Praneswari Devi died when Gopinath was only 12. He was a follower of the Gandhian principle of non violence as a political tool. Due to his unselfish dedication towards Assam and its people, the then Governor of Assam Jayram Das Doulatram conferred him with the title "Lokapriya" (loved by all). He passed matriculation in 1907 and admitted in Cotton College. He passed I.A. (Now a days known as Higher Secondary) in 1st Div. In 1909 and took admission in the renowned Scottish Church College, Calcutta and graduated in 1911. He then passed M.A. from Calcutta University in 1914. He studied Law for 3 years but came back to Guwahati without sitting in the final examination. Then on request of Tarun Ram Phukan, he took up the temporary job as Headmaster of Sonaram High School. During that period, he sat and passed in the Law examination and started practising in 1917 in Guwahati. Assam Association was the only political organization of Assam in that period. Assam Congress was formed in 1922 as a branch of the Indian National Congress. Gopinath bordoloi's political life started when he joined the Indian National Congress as a volunteer in that year. He actively participated in the fight for independence. He was arrested in 1922 due to active participation in the Non-cooperation movement and was put in jail for 1 year. When the movement was called off following Chauri Chaura incident, he went back to practising law. From 1930 to 1933 he kept himself away from political activity and got involved in various social works after becoming member of Guwahati Municipal Board and Local Board. In addition, he was constantly demanding a separate University and High Court for Assam. After rising through Congress ranks in the 1930s, Bordoloi's biggest battle came as Bengal's Muslim majority wanted to include the overwhelmingly Hindu Assam in a Muslim-majority Pakistan. Organizing protests and engaging the colonial government on the highest level prevented mass communal riots in Assam and allowed for it to preserve its territorial integrity within India. After India's Independence, he worked closely with Sardar Vallabhbhai Patel to secure Assam against Communist China and East Pakistan, and also organize the return of millions of refugees who fled East Pakistan due to widespread violence and intimidation during partition. His work gave a base of communal harmony, democracy and stability which kept Assam secure and progressive right up till the 1971 war over East Pakistan's independence. Tall, elegant and handsome Gopinath looked like a tribal "gaonbura". He was simple in his dress and always wore Khadi. He was suave in manners and beneath his rough exterior there was the softness of humility. He was a deeply religious man, being particulary influenced by the Gita. He was also a good singer and used to sing Vaishnava devotional songs. 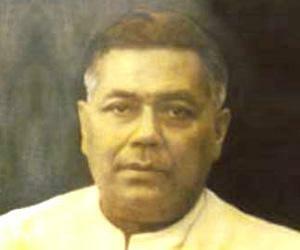 Gopinath Bordoloi was died on 5 August 1950. 1) Bharat Ratna posthumously in 1999. 2) Named Guwahatai International airport as Lokpriya "Gopinath Bordoloi International Airport".